Slow your fast eater! 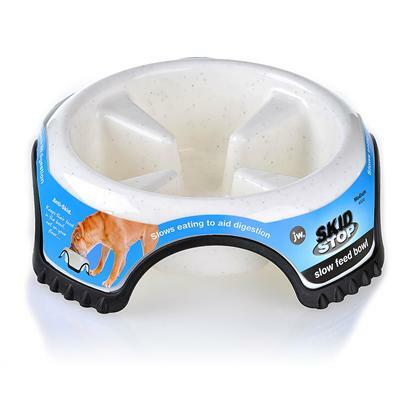 The Skid Stop Slow Feed Bowl is designed to help your dog stop wolfing down their food. Fast-eating dogs often suffer from bloating and digestive discomfort, so it's important to encourage your pet to take it easy. The Skid Stop Slow Feed bowl helps your dog avoid the effects of fast-eating, stays in place and is extremely durable. Available in 3 sizes Medium (8.5 x 2.5" x 8.5" - 2.6 oz.) Large (10.5" x 3.2" x 10.5" - 3.2 oz.) Jumbo (13.2" x 4" x 13.2") "